Not that I don't know which ones are each, what I want to know is if there is any way to see it in those games. For example, a Ground move and something telling that it is physical, or a small icon indicating that it is, like in other Pokemon games, which have text and icons. 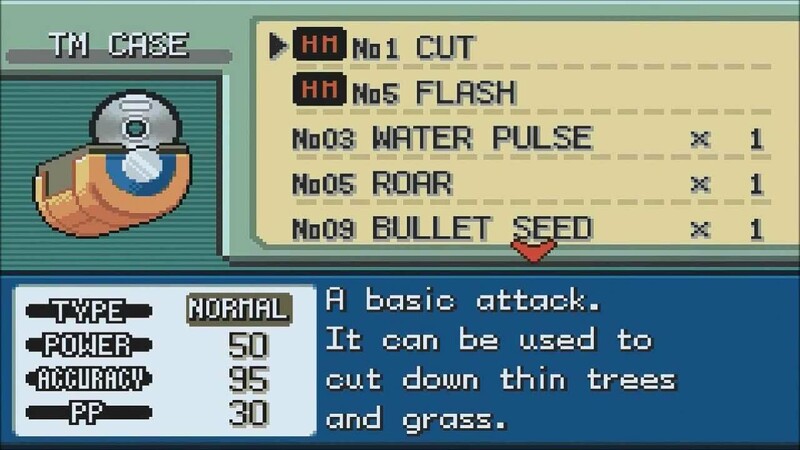 And, in that generation, Ground moves are always physical, but do they have any icon or text indicating that Ground type moves are physical and Water are special, for example? This needs a BA for my sanity and piece of mind. Please, someone, choose one of them. Like Stakatacool said, before Generation four, Physical and Special attacks were determined by type. You must use the bumpers. (L and R buttons) When you press either bumper, a list of hints, and useful questions and stuff pops up. Choose: "What does this term mean?" and select ATTACK or SP. ATK. It'll show you a list of the Physical types or Special types, depending on which you chose. I don't know if it works for the other systems, but it should. 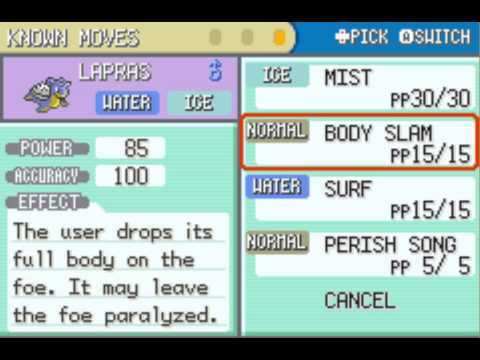 As you can see from this screenshot there is no icon or text that indicates whether it is a physical or special move. No indicators of move categories in the TM page either. yeah, in all the GBA games, moves being special or physical were determined by type. Poor Fareon, a physical attacker with a special STAB in those days. What is the name of the girl character you play as in FR/LG? Is "Crunch" a physical or special attack in Gen. 3 (FR/LG/R/S/E)?